The onset of a new year raises questions about what the future holds. MIPIM Asia went further, inviting us to the Year 2030 and beyond, and presenting the potential for sustainable and efficient infrastructure that could redefine our everyday lives. MC Construction’s Development Director and I attended the two-day event held in Hong Kong where Eastern investors, property developers and market analysts come together to discuss projections for best returns on capital investment. This year’s conference theme encouraged a sense of responsibility: real estate professionals were implored to ‘Invest in a Better Tomorrow,’ with seminar sessions showcasing the world’s most sustainable building projects and the latest advances in ‘Proptech’ from both global technology companies and startups. The challenge? To make greener and smarter initiatives practically and commercially viable for the many players involved in shaping the built environment. According to the UN, 60% of the world’s population will live in cities by 2030, rising to 68% by 2050 – up from 55% today. Cities account for 60-80% of the world’s energy consumption and 75% of carbon emissions. 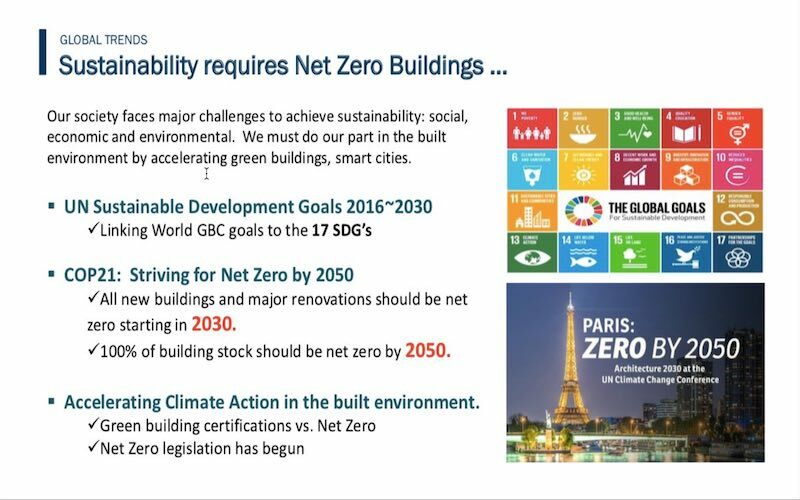 Tackling climate change and creating sustainable cities and communities are two of the 17 goals of the UN’s 2030 Agenda for Sustainable Development. Sustainable masterplanning – in which Mother Nature does some of the work – is key to success. 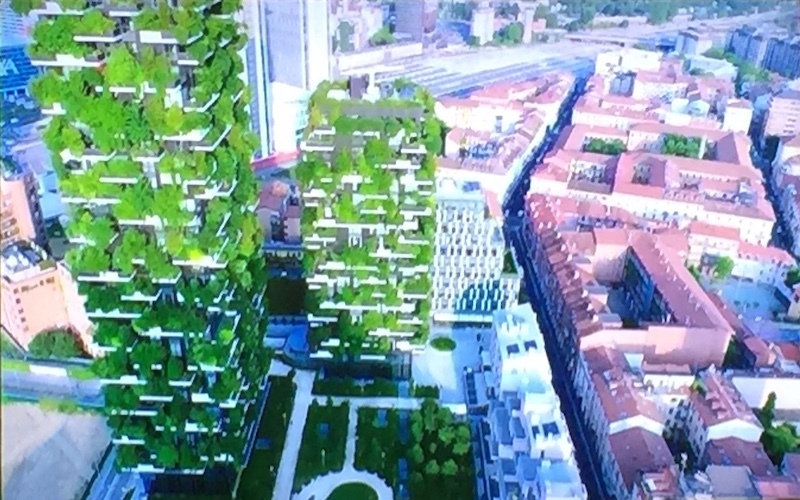 On day two Italian architect and urban planning company Stefano Boeri shared plans for Asia’s first ‘Vertical Forest.’ Following the RIBA-award-winning ‘Bosco Verticale’ dual towers project in Milan, Boeri substantiated his claim that growing trees alongside and across buildings is a practical and low-cost solution in the fight against climate change. Sensors from the towers reveal air quality to have improved and show a reduction in both the heat island effect and energy consumption. By way of testament, some 20 species of birds have made these structures their home. The Nanjing Green Towers project, in China’s Jiangsu province, will again comprise two residential towers. Asian cities are the fastest growing in the world and typically limited in flora and fauna. To meet this challenge, the towers will be taller than the ones in Milan with cascading plants and shrubs set to absorb 25 tonnes of carbon dioxide a year and produce about 60kg of oxygen per day. Such projects are making an impact: 93 countries attended the Food and Agriculture Organization of the United Nations first World Forum on Urban Forests last year. Yet critics cite lack of incentive for developers, expensive maintenance and climatic restrictions as prohibitors. It is only when developers include long-term OpEx in their return on investment and engineers calculate building performance using greenery that take-up is likely to gather momentum. The Re-imagining Cities Foundation presented its admirable but ambitious mission. It seeks to find attractive sites in major cities, work closely with local developers and global experts, and showcase ‘smart, sustainable future city districts’ at attractive investment returns. The Foundation appreciates the huge problems that urbanisation creates; overstretched infrastructure, affordable housing and pollution to name a few. 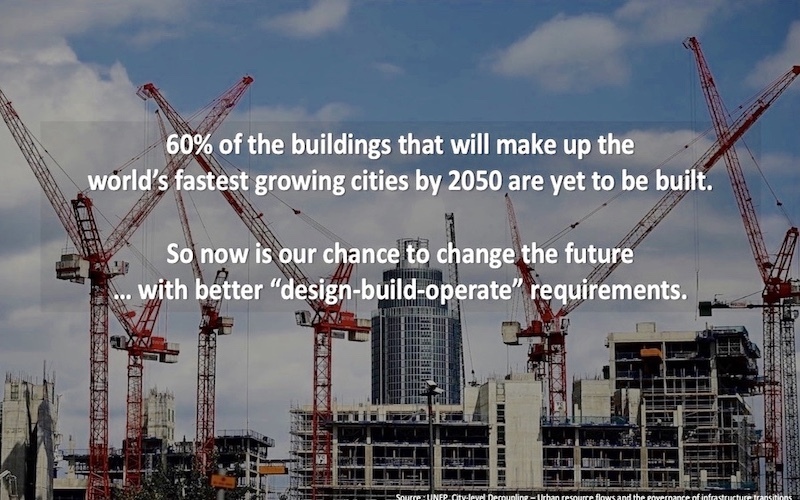 Although commercial and residential buildings consume a third of the world’s energy it is keen to point out that 60% of the buildings that will make up the world’s fastest growing cities by 2050 are yet to be built. Here, it believes, lies the solution. Sustainable development can tackle these urban issues and at the same time reap efficiencies and long-term financial rewards. Delegates were introduced to The Edge in Amsterdam, the greenest building in the world According to BREEAM rating agency, with a 98.4% sustainability score. 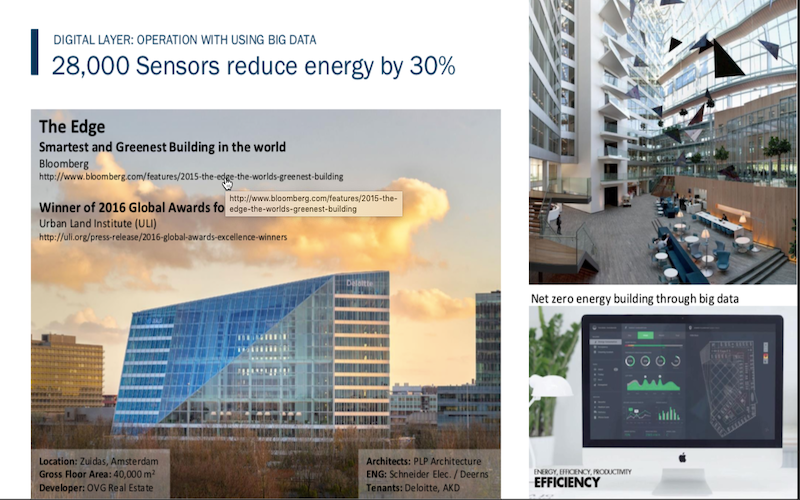 Its solar panels create more electricity than the building uses and the 28,000 sensors deployed around the building inform centralised dashboards which display everything from energy consumption to room occupancy to coffee usage and reallocate resources as required. The landscaping also features vegetation and wildlife that help support the city. Employees hot desk through the use of a mobile phone app which checks a worker’s schedule, recognises his or her car on arrival and allocates a parking space and desk accordingly. These desks are then set to individual preferences for factors such as heating and lighting. This system allows 2,500 Deloitte employees to share 1,000 desks. Return on investment, we were told, is expected to take place after 8.3 years. 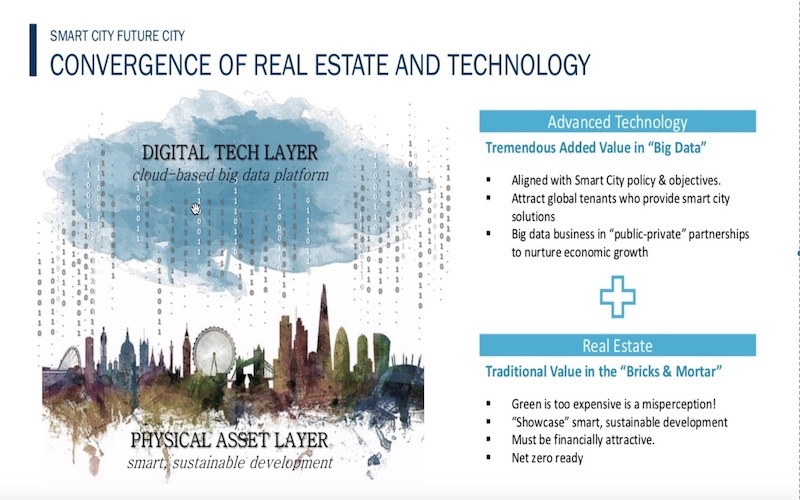 The solutions presented at MIPIM Asia could ultimately determine investment strategy: developers will one day use big data to assist with decisions on what, where and when buildings are needed. There is, of course, no magic roadmap to reaching this point but we came away enthused by advances in PropTech and energised by pioneering organisations like the Re-imagining Cities Foundation who work to address much more than returns – the triple bottom line of people, planet and profit.